Sunday 11th was day 2 for Stig and we fished the north again. Around the same time as the day before we hooked a blue marlin. 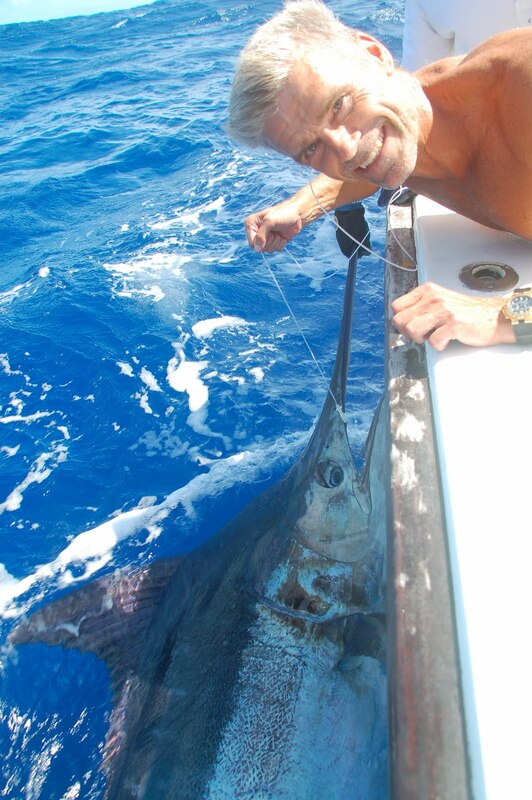 Stig was fighting the fish for 45minutes until he could release his first blue marlin on this trip. 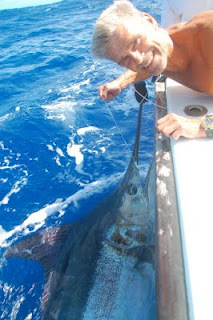 Th fish was aond 700 pounds and ate the Kona Pro Jet from Black Bart. After that we put the lures back in the water and when I was putting the teaser in the right position a blue marlin came and attacked it. I pulled the teaser out of its mouth and the fish came to the Kona Pro Jet. But the marlin missed the lure and got hooked in the dorsal fin. So a spectacular fight began and it took us 2 hours in rough sea till we could get the leader. The fish was around 750 pounds.